"1.a. the sense that distinguishes the sweet, sour, salty, and bitter qualities of dissolved substances in contact with the taste buds on the tongue." "b. This sense in combination with the senses of smell and touch, which together receive a sensation of a substance in the mouth." In its first definition, the American Heritage Dictionary limits the tastes perceived by the taste buds to four; in fact there are at least two more in addition to the classic four: there is the taste of fat, and a taste called umami. Umami means delicious in Japanese, and is the word for the savory taste of meat. In this way, our taste buds are designed to tell us about the nutritional qualities of the food we eat: sweet for ripe fruit and carbohydrates, sour for unripe fruit and vitamin C, salty for salt and other minerals, bitter for poisonous plants, umami for protein, and fat for...fat! The second definition, which includes smell and touch, is the one most people have in mind when they talk about the taste of a food - taste, in this sense, means flavor. Smell - better than any of the other components of flavor - allows us to determine the specific food we are eating, for example smell helps us distinguish a lemon from a lime. In fact most people can distinguish among many thousands of odors, and perfumers more than 10 000! The sense of touch provides us with information about the texture or "mouthfeel" of a food. Texture includes both the slipperiness of an oyster and the fizz and prickle of a carbonated beverage. This sense of touch is joined by the ability to feel temperature and pain. Amazingly, menthol activates the tongue's nerve endings in the same way that cold temperatures do, which is why we can talk about the coolness of a mint; and jalapeños activate these nerve endings in the same way as do heat and pain, so talking about the "burn" of chili peppers is right on the mark! Taste cells throughout the mouth and throat cluster together to form taste buds. 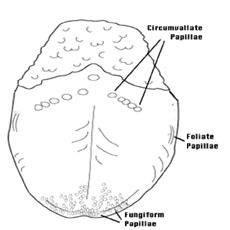 Isolated taste buds are scattered on the surface of the palate and throat, but on the tongue they are grouped in specialized structures called papillae: mushroom-shaped fungiform papillae in the front of the tongue, leaf-shaped foliate papillae protruding from the sides, and circumvallate papillae arrayed in a chevron at the back of the tongue. The taste cells and their associated nerve endings form bud-like structures under the surface of the taste papillae. The tips of the taste cells reach toward a tiny opening on the papillae - the gustatory pore - through which food chemicals can fall. 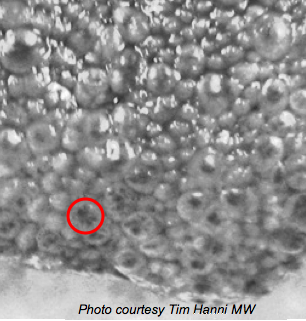 In this picture of the tip of a tongue we see a large number of flat-topped fungiform papillae with dark taste pores. The red circle surrounds one of these taste papillae. 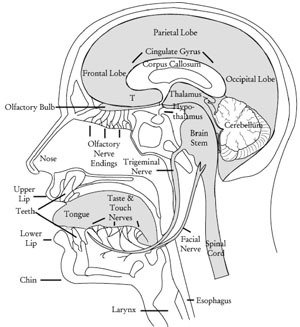 Three nerves carry taste messages from taste buds: the facial nerve, shown in the picture, which brings messages from the anterior two-thirds of the tongue; the hypoglossal nerve, which brings messages from the posterior tongue; and the glossopharyngeal nerve, which brings messages from the throat area and the palate. The trigeminal nerve, which has branches throughout the mouth and nose, carries messages from the touch/temperature/pain system. All of these nerves bring their messages to the brainstem, which is described on the next page. [Image from Wikimedia Commons by Patrick J. Lynch, medical illustrator.] Molecules of the food you are eating go into the air in your mouth. 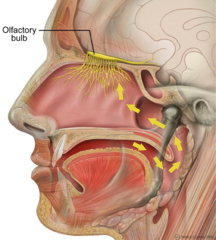 They move through the back of the throat and up into the nose to reach olfactory nerve endings in the posterior part of the roof of the nose (yellow arrows). The molecules bind to these nerve endings, which then signal the olfactory bulb to send smell messages to the brain. Where did the idea of four basic tastes come from? Edward Bradford Titchener (1867-1927) popularized the notion of four basic tastes in his best-selling textbook, "An Outline of Psychology," first published in 1896. He noted: "Taste has four qualities and no more. Smell seems to have a very large number of qualities." Titchener's teacher was Wilhelm Wundt (1832-1920), a German physician who is considered the father of experimental psychology. Wundt's major work lay in the study of perception. His approach to exploring perception was to have subjects experience a stimulus and then describe their experience in a directed and systematic way, an approach called experimental introspection. In this way Wundt arrived at the idea that there are only four basic tastes. Upon completion of his PhD with Wundt in 1892, Titchener was invited to become Chairman of the Department of Psychology at Cornell University. Through his teaching, papers, and textbooks, he became one of the most influential psychologists in America at the turn of the 19th to the 20th centuries. His major contribution was his insistance that psychology was a science, not a branch of philosophy. At Cornell he developed an experiment-based psychology curriculum that emphasized new discovery and experimentation over rote memorization and repetition of the work of others. He expected students to participate in his laboratory for the study of sensory perception, which was specially designed to explore all the senses: vision, hearing, touch, and our sense of time, as well as taste and smell.